maximize your business productivity and efficiency. A series of industry trends are reforming the finance and accounts management needs of businesses of all sizes, especially the SMBs. As these companies grow, they face the same requirements as their larger counterparts. At the same time, advancement in technology has created increasingly dispersed personnel that have to submit essential data to an organization’s financial system and be able to access this information from anywhere, anytime to do their tasks. QuickBooks was once considered as a complex and costly software application, with significant upfront investment. However, QuickBooks is now most preferred accounting software among accounting professionals. 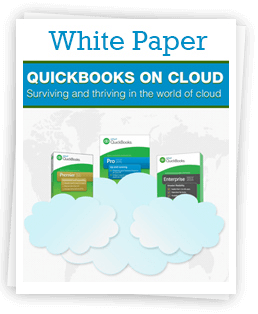 Cloud technology, with real-time functionality features, has further advantage to the solutions offered by QuickBooks. This whitepaper outlines the statistics and observations in the development in this field and explains how cloud computing is gaining widespread adoption among organizations of any kind.